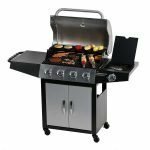 A portable gas grill that you can live on your deck or patio, that is also light and portable enough to take with you can be incredibly convenient. 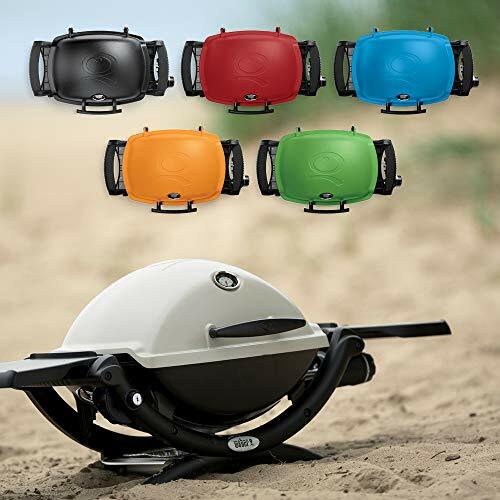 The Weber Q1200 was designed to fit this bill with much of Weber’s traditional durability and thoughtful design. 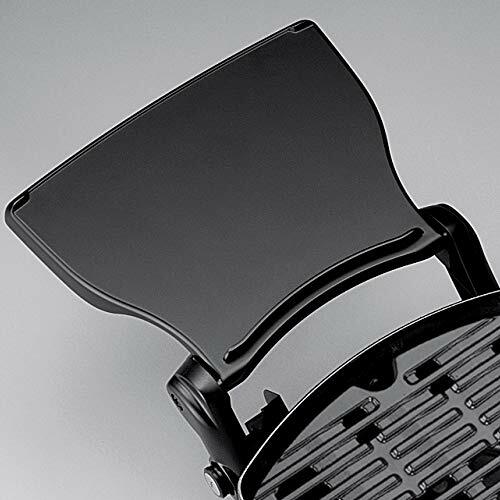 The Weber Q1200 was originally designed to be able to sit on a tabletop. This allows it to live on your patio table on your average weekday. Yet when you want to take it on the go to a tailgating party, beach trip or camping vacation, it can sit just as easily on the tailgate of your truck or a picnic table. 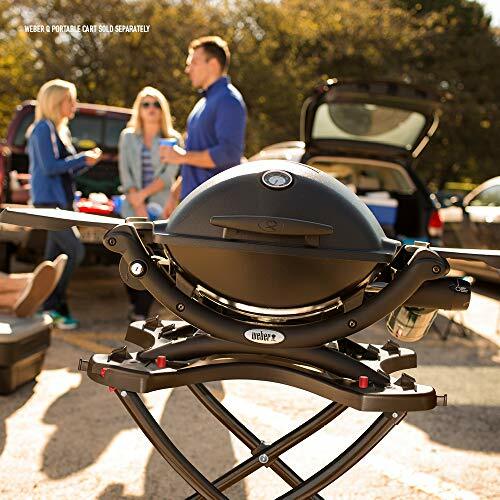 It’s also worth noting that the Q1200 is compatible with Weber’s 6557 portable cart, which can provide you with a more stable base, no matter where you bring the gas grill. The cook box and shroud are made from durable cast aluminum which requires minimal care and maintenance, while also being able to withstand high heat as well as frequent use. It is also available in a range of colors starting with classic black but also including more interesting shades like red, blue, green, and fuchsia. The cast iron grill grates provide 189 square inches of grilling space and are coated with a special layer of porcelain. This helps maximize heat retention and reduces the chances of food sticking. The protective layer also helps with rust prevention and allows you to clean up a major mess by soaking the grates in good old-fashioned warm soapy water. The single stainless steel propane burner produces 8,500 BTU’s of heat. 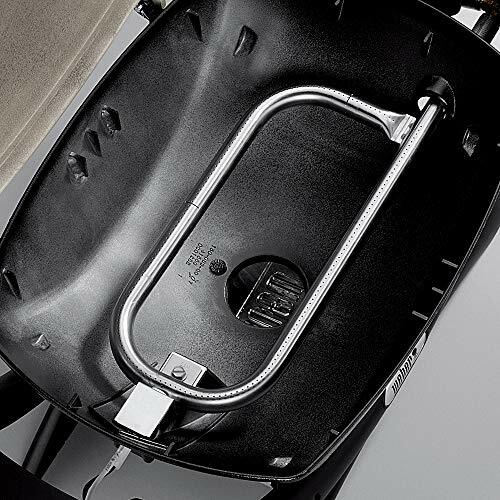 It is designed to run off of a small 1.2-pound propane canister, which can potentially feed the unit for up to 3-hours on low heat. The small canister can be a little awkward to screw into place. If you would like to use a large tank on your deck, patio or camper, then you will need to purchase Weber’s 6501 propane adapter hose. 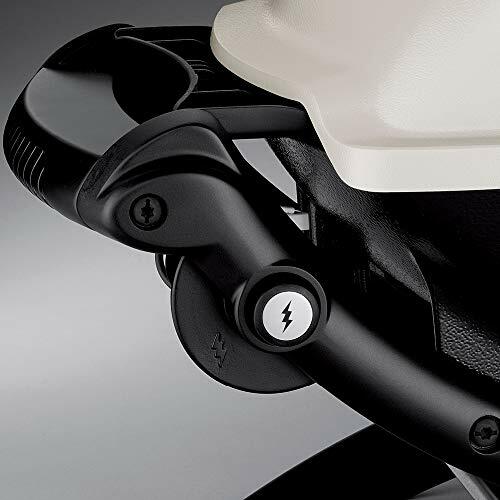 The propane burner comes with an electric igniter that runs on simple AAA batteries. The Weber Q1200 is designed to only work with either a propane cylinder or a propane tank with a tank fed by an adaptor hose. If you have a natural gas hook up at your home, there is currently not a conversion kit available. Weber takes their usual approach to quality with the Q1200. The cook box is made from durable cast aluminum. The single propane burner is made from high-quality stainless steel. 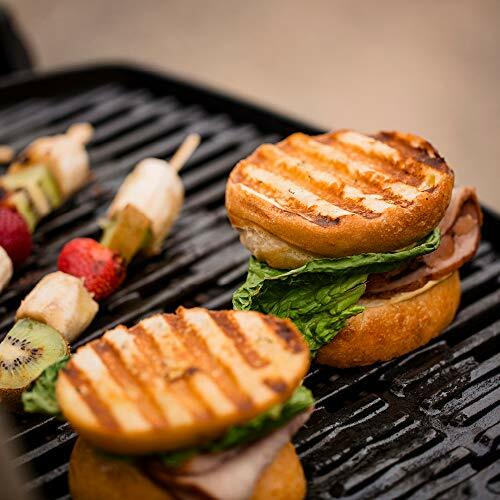 The cast iron grill grates are coated with a special non-stick porcelain material, which provides them with superior heat retention as well as easy cleanup. Assembly is a snap. Most of the Weber Q1200 comes pre assembled and ready to use after unpacking. 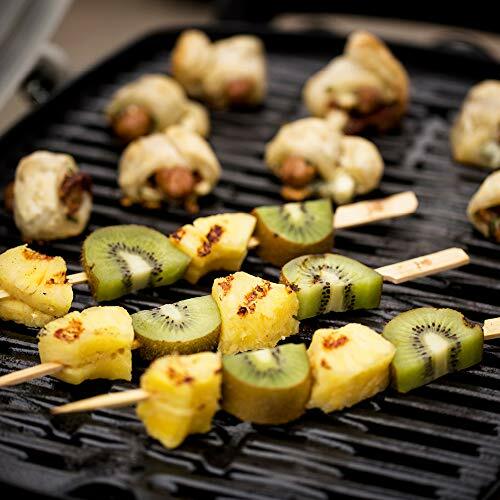 You should be able to screw the propane canister in place and start grilling in under 15-minutes. The Weber Q1200’s single stainless steel propane burner is rated to generate 8,500 BTU’s of heat. This is enough to cook most common grilled foods. Just make sure that you allow the grill proper time to preheat, so the cast iron grates can absorb enough heat to impart a good sear before you place the meat or vegetables. One potential problem with Q1200 is that it wasn’t designed with any form of wind baffle. On a very breezy day, it is possible for the fire to blow out. However, the burner is still very strong. If there is a lot of wind in the forecast, you should be able to get around it by positioning the grill with the back to the wind or with a vehicle or wall as a wind block. 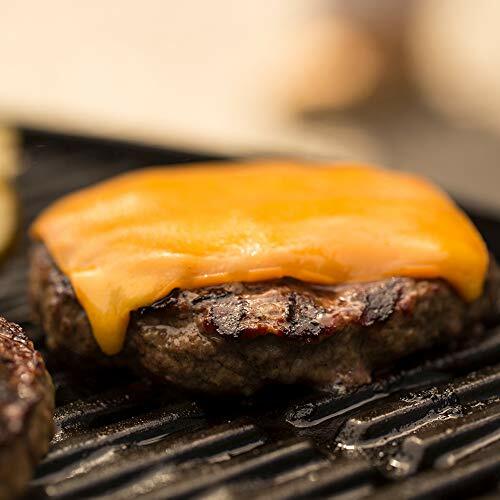 The cast iron grill grates provide 189 square inches of grilling space, which is more than enough to grill up to four hamburger patties. The grill grates are coated with a special layer of porcelain which helps maximize heat retention and reduces the chances of food sticking. The electric igniter runs on AAA batteries. This is somewhat rare for portable grills. Most competitive grills in this size require quick reflexes to start with a lighter or matches. 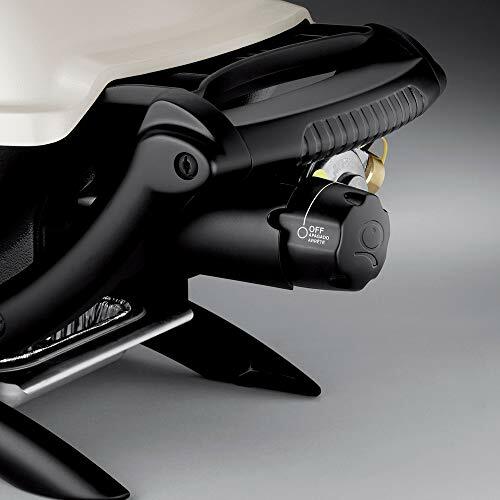 The Weber Q1200 is relatively easy to clean. The porcelain layer on the cast iron grill grates reduces the chances of stuck-on material and usually requires little more than a gentle brushing with a wire or nylon bristle grill brush. If there is some stubborn material the grates can be easily removed and soaked for a few minutes in warm soapy water. 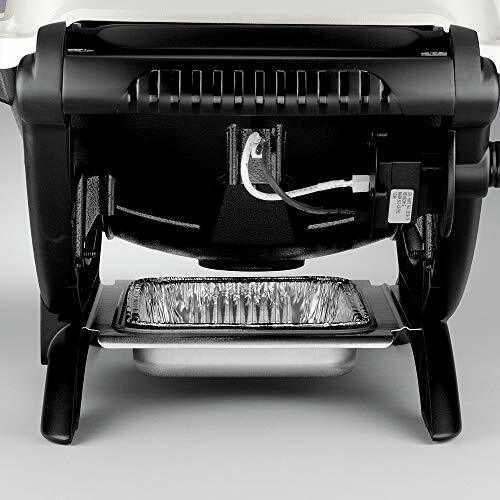 The Q1200 has a relatively large drip tray for a grill this size. It’s easy to remove to pour away any excess marinade or greasy runoff. One thing to keep in mind is that the cast aluminum of the interior cook box can potentially react with something like an acidic marinade, leading to gradual staining issues. 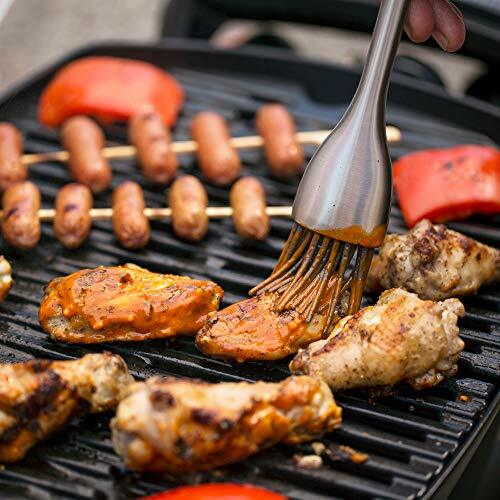 If you do have something like a lemon pepper marinade drip down or spatter up, you should scrub or wipe it away after you are done grilling. 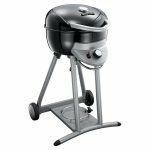 The Weber Q1200 has a multi-tiered limited warranty. The cook box, lid, stainless steel burner tubes, cast iron grill grates, and plastic components have a 5 year, no rust through or burn through warranty, assuming normal use. The paint comes with 2-year warranty excluding fading or discoloration. All other parts come with a standard 2-year warranty. Some online retailers also offer an additional protection plan for a very reasonable price. 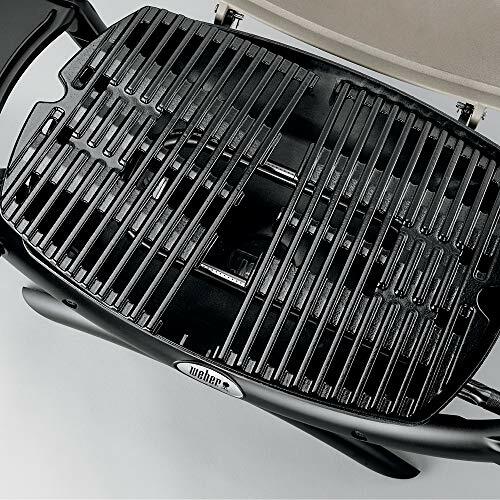 If you are looking for a lightweight, high-quality grill that can be just as much at home on the tailgate of a pickup truck as it is on your deck, then it’s hard to look past the Weber Q1200. It offers convenience, and quality combined with a friendly price point. It’s even available in a variety of attractive colors. None of our reviews are sponsored, we are reader supported and may earn money through the affiliate links. This does not influence the honesty of our reviews. None of our reviews are sponsored, we are reader supported and may earn money through the affiliate links. This does not influence the honesty of our reviews. © Best Grill Reviews | All rights reserved.